Then, Sarah van Gelder of Yes! Magazine tells us why she set out on a 12,000 mile odyssey around America to find models for grassroots action. 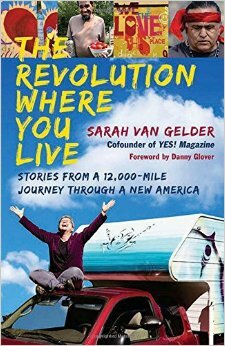 Her book is The Revolution Where You Live. Many observers asked whether it was a flash in the plan or the beginning of a new people’s movement. Since the election, there have been signs that the American people are waking up to defend rights they feel are threatened by the new administration and Republicans in Congress: women’s rights, environmental rights, voting rights, civil rights, workers rights and the rights of immigrants. Our guests this hour have dedicated their lives to real democracy. Ralph Nader’s activism has been directly credited with the passage of landmark laws for protecting American consumers, including the Clean Water Act, the Freedom of Information Act, the Consumer Product Safety Act, the Foreign Corrupt Practices Act, the Whistleblower Protection Act, and the National Traffic and Motor Vehicle Safety Act — that last one mandated the seat belts that have saved hundreds of thousands of lives. 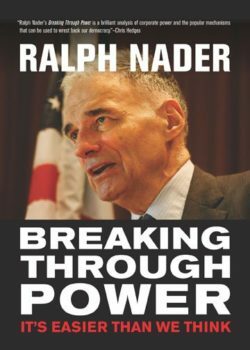 Nader has been repeatedly named to lists of the “100 Most Influential Americans”, including those published by Life Magazine and Time Magazine. He’s the founder of the pro-democracy organization Public Citizen. His new book Breaking Through Power: It’s Easier Than We Think is a guide for activists, whether newly minted or experienced, who want to exert the power of the people to move our political system on our behalf.